Yep, I've turned into one of those moms. You know- the kind who match their outfits with their daughter's. At least it's only on special occasions. For myself, I made the Colette Ginger skirt. 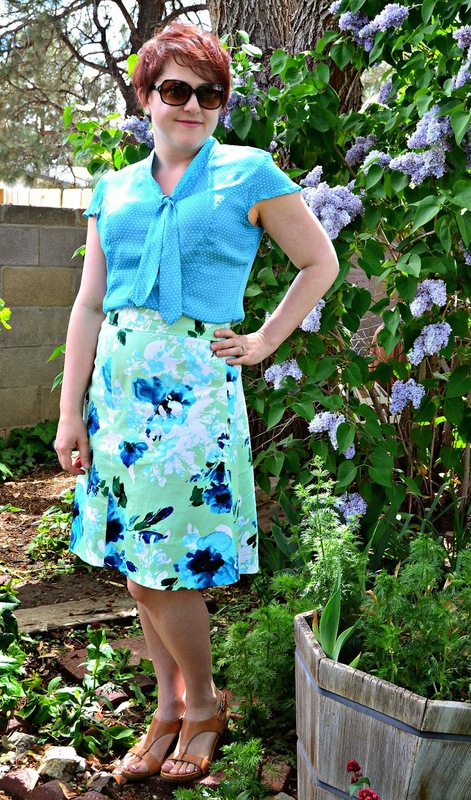 This is a great pattern for a basic, A-line skirt. It went together super quickly. I like the high waist style. It is flattering and has a bit of a vintage vibe. I used a cotton stretch sateen print from Gorgeous Fabrics. It's been in my stash for a while until I could figure out what to do with it. I originally intended on making a dress with it. I love the colors and large floral print. However, I thought it would be a bit overwhelming on me as a dress so I opted for a skirt. I think it turned out nicely. One word of caution. I fell in-between sizes on the size chart so I opted for the larger of the two. I still had to let out the waist seam allowances by 1/4 inch on each side- 1 inch all the way around. I am really happy with this skirt and received lots of compliments the first time I wore it. This is another one I could see making up in several prints for lots of options. 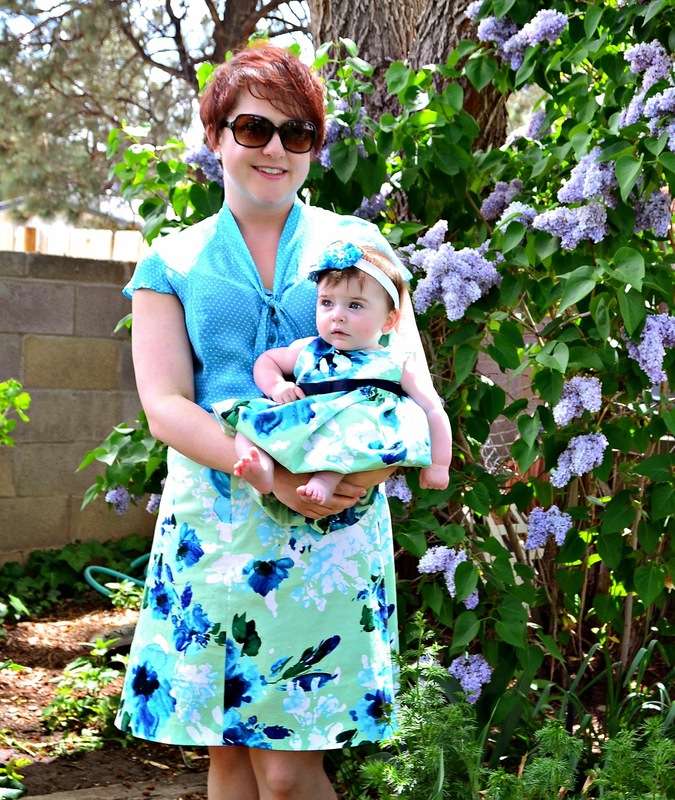 For the baby, I used Simplicity 3854 to make her dress from the same fabric. For such a little dress it was actually quite fussy! The instructions would have you finish the neckline and sleeves with bias tape. Despite the bias, I couldn't get the tape to stretch enough to lay flat after stitching. So after fighting with it, I ended up cutting a lining for the bodice and finishing it that way. I then preceded to sew the lining in incorrectly and having to rip it out- at least that one was my fault. In the end, it did come out really cute. I love the poofy skirt! And, I made her the matching headband! Very pretty outfits. Perfect for spring. I have the Ginger Skirt pattern but haven't made it up yet. You might have just inspired me to give it a go. Oh love, love, love! Beautiful both of you. I love a good match up! Oh, my grinchy heart doth melt- you both look so pretty! Nothing wrong with mommy/daughter outfits. You both look beautiful. 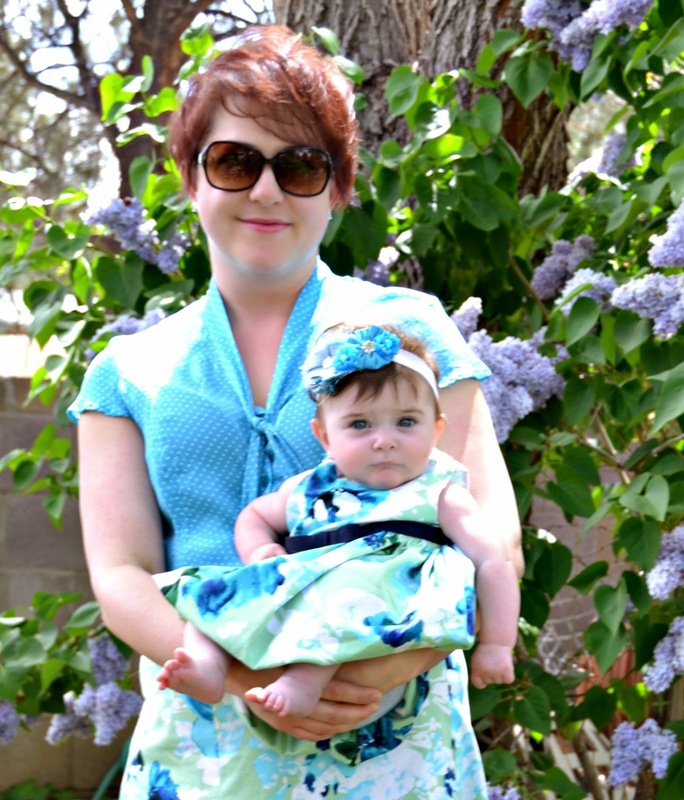 Love your Ginger and the matching dress on your adorable wee one.